You know those cookies you get on the airplane? The ones you’ve never seen in the store before, but have a most intriguing flavor? Biscoff Cookies! I used to get them on United all the time, and my husband recently brought one home from a Delta flight. After I had my baby, Sam brought over Biscoff Spread, and it totally won me over! Sam and her kids are longtime fans of the spread, and after bringing me into the fold, we wanted to think of creative ways to use the cookie butter. Here are just a few. 1) Biscoff & Banana “Ice Cream” – In a blender or food processor, blend a few frozen bananas with about a tablespoon of Biscoff spread to make banana “ice cream,” a healthy treat with a creamy texture. Serve immediately – the mixture doesn’t stay creamy for long nor does it freeze well. 2) Cookie Spread Cookies or Cookie Spread Granola – Switch out with peanut butter in a cookie recipe to make cookie-spread-flavored cookies. You can do the same with these wonderfully simple Homemade Granola Bars. 3) Biscoff Toasties – Instead of peanut butter, use Biscoff between a couple pieces of bread with marshmallows and make a pocket sandwich on the stovetop in a Toas-Tite! 4) Fruit Dip – Slice apples, pears, jicama or other produce and use Biscoff as a dip or spread. Top with raisins, dried cherries or dried cranberries for an extra sweet, antioxidant-rich punch. 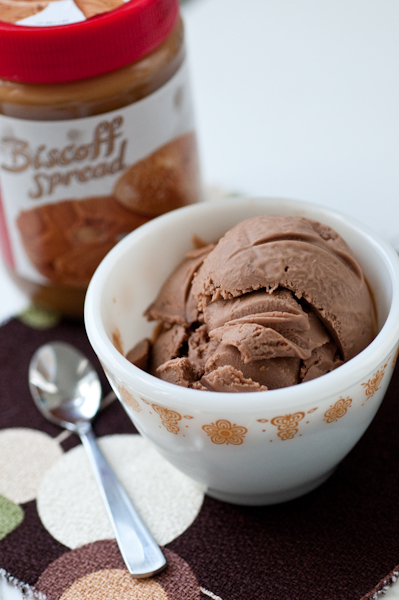 5) Chocolate-Biscoff Ice Cream – Break out the ice cream maker for this easy recipe! In a saucepan, bring 2 cups half-and-half, ¼ cup cocoa powder, ½ cup sugar and a dash of salt to a boil, stirring frequently. Add a couple of tablespoons of Biscoff spread to the hot mixture and stir well to incorporate. Chill overnight in the refrigerator. The next day, put the mixture in the ice cream maker and blend for about 20 to 30 minutes. Enjoy as soft serve or freeze for a firm ice cream that can be enjoyed for days. Makes about 3 cups. Do you like Biscoff spread? What about Speculoos or Trader Joe’s Speculoos spread? How do you use it? Biscoff = Crack. If I buy a jar, it’s not going to last long! I like it drizzled over oatmeal and bananas. Thanks for sharing the new temptations.